We get a lot of questions about our product in relation to old designs being marketed as the best thing since sliced bread. Below are the facts about the ProPride 3P hitch in relation to the old Hensley Arrow design. You will not always get the facts when speaking to the company that makes the old design. No product in the history of the world ever stays the same. A constant improvement process must continue daily for a company to stay viable. That is the way we approach our product and the way Jim Hensley continues to improve his original design. Is the ProPride 3P similar to the Hensley Arrow hitch? Yes, both hitches operate through the exact same principle of pivot point projection. Jim Hensley's original design patents addressed the mechanism for this projection. He licensed those patents to a man named Colin Connel who started the company Hensley Mfg., Inc. Jim Hensley never sold anything to the company named after him. He only licensed his patents to them. Through the years Jim continued to make improvements to his original design but the company never licensed any of them. In 2007, ProPride licensed all of Jim Hensley's patents to improve his original design. The complete story is on The Jim Hensley Hitch Story page. 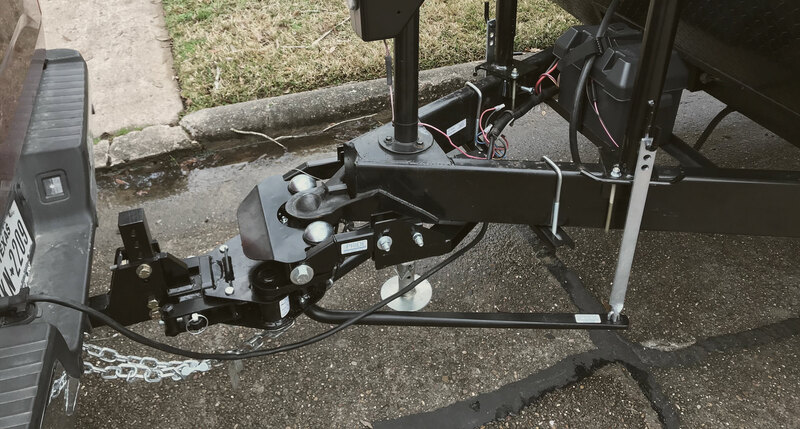 What improvements have been made in the ProPride 3P compared to the Hensley hitch? An adjustable hitch bar to match different tow vehicle and trailer tow heights. This will save the 3P ProPride hitch owner $100-$150 in shipping charges in the future should a different offset hitch bar be needed for a new tow vehicle or trailer. The Hensley Arrow uses a welded hitch bar and the company offers a "free" exchange. Free isn't accurate due to the customer being required to pay the shipping of the new bar and return shipping of the old bar. The hitch bar wedges and the hitch box have a greater angle to help in hitching and unhitching without the bar sticking in the hitch head. Hitching and unhitching the 3P ProPride hitch is MUCH easier than the Arrow. This is the feature that many of our customers who have owned Arrows in the past comment on most frequently. A one piece yoke holds the hitch head square to the front of the trailer and doesn't allow pivoting on the ball. This replaces the strut bars on the Arrow hitch. The independent strut bars do become loose from time to time on the Arrow hitch and allow the trailer to sway. When two independent strut bars must work together as one piece there is twice the probability of a problem. A SINGLE WELDED yoke will not become loose. Even if a frame bracket slips the yoke will not allow the trailer to sway. If an Arrow frame bracket slips it will allow the hitch head to pivot side to side and may damage the hitch. The 3P ProPride hitch requires NO drilling into the frame for installation. Holes placed in the trailer frame weaken the frame. We do not think it is a good idea to drill holes in the trailer frame and weaken it. The Arrow requires holes to be drilled in the frame to hold the frame bracket. The weight distribution jacks sit on top of the frame rather than hang on a pin outside of the frame. This provides better leverage for the spring bars by moving the tail ends of the bars closer together and also eliminates any possibility of the pin bending like can happen in the Arrow design. The spring bars on the 3P ProPride hitch are bolted into the hitch head rather than a hanging on a spring loaded keeper like with the Arrow. The bolt in design will not wear and allow the spring bar to fall out of the bottom of the head. The steel is properly pre-treated for powder coating. This will help prevent against chipping and rusting. The Hensley Arrow paint problem is well documented on the internet. To date, not one issue has been reported with the 3P hitch. This will insure longer life for your hitch. The control links are thicker. The control links are under a great load so the 3P increased the strength to prevent any bending. The 3P hitch box has been reinforced to eliminate warping of the top edge of the box. Over time, the top edge of the Arrow hitch box bends under the weight distribution load. This diminishes the effectiveness of the weight distribution. The 3P hitch box design addressed this issue and solved it. How is the ProPride 3P trailer sway control hitch different from other sway control hitches? Conventional trailer sway control hitches apply some type of friction force to damp trailer sway. When a force is applied to the trailer it will attempt to pivot at the hitch ball. Any hitch that allows the trailer to pivot on the ball will allow the trailer to sway. Many hitches have friction forces integrated into the hitch design to damp that sway force. The 3P works by projecting a virtual pivot point(tm) to near the rear axle of the tow vehicle. With Pivot Point Projection(tm), or 3P, technology incorporated in the main hitch head, the trailer's effective pivot point is no longer at the hitch ball when a force acts upon the towed trailer. The forward effective pivot point of the trailer shortens the lever arm distance between the pivot point of the trailer and the rear axle of the tow vehicle. Shortening that distance has a dramatic effect on the stability of both the trailer and the tow vehicle when the trailer is acted upon by an outside force. Many people who tow fifth wheel trailers or gooseneck trailers are familar with the stability that a forward pivot point provides. How do I turn a corner if the pivot point is near the rear axle? The 3P technology is single directional. That means that the effective pivot point is only near the rear axle when the trailer attempts to pivot with a force on the trailer side of the hitch. When a turning force is applied from the tow vehicle side of the hitch, the effective pivot point is at the hitch and allows for total control of the trailer from the tow vehicle. Is the ProPride 3P also a weight distribution hitch? Yes, the 3P has weight distribution integrated into the design of the hitch. The sway control feature of the 3P is completely independent of the weight distribution feature. The weight distribution feature is operated through two heavy duty weight distribution jacks. These jacks allow the user complete control over how much weight is distributed to the tow vehicles axles.